Some of the best ideas – in fact, maybe a majority – are not complicated and Pin High Pro is both a good idea and not complicated. A primary fault of recreational gofers is the lack of weight shift to the left side during the downswing. The old “hang back move” and “over the top” are both caused by poor weight transfer. Weak pops to the right, outright slices, pull shots and other score robbing outcomes can be traced to this basic swing fault which is easy to understand but for many golfers, hard to do. Pin High Pro can help. It’s a simple disk just over 4 inches in diameter that the user places under his left foot at address and then just makes a swing. 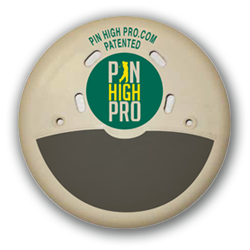 The Pin High Pro produces a distinctive click when depressed as the swing moves the weight to the left side. If the click occurs after the club has passed the ball the user can practice to improve his timing so the click happens before, which of course is the secret to the lag motion in the downswing preached by all instructors. Crisper shots, more distance and better accuracy are the result. 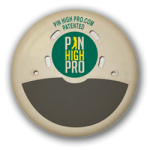 Perhaps best of all the Pin High Pro is not computerized, “Bluetooth-enabled” nor hi-tech in any way. Uncomplicated, simple and it produces results.